You've eaten at Wandering Goose on Capitol Hill, now read the book! A lovely fable about Bug and Goose written by Heather Earnhardt and gorgeous artwork by Frida Clements. Reverse that: read the book, fall in love, and reward yourself with an excellent meal! "For the goose and bug that fall in love in this quietly moving story from debut talents Earnhardt and Clements, a happy ending isn’t in the cards—at least, not as a couple. Published for adults, though appropriate for younger readers, the story follows the animals from happy days of reading poetry and chasing fireflies to their eventual breakup ('The majestic Mississippi is calling me,' Goose tells Bug). Clements’s illustrations suggest a combination of Beatrix Potter, Art Nouveau botanical designs, and Japanese prints as she pairs Bug and Goose’s love with bursts of carrots, spring peas, and nasturtiums; their separation with heavy autumn storms; and Bug’s eventual rebound with the floral bounty of summer." "This is a beautiful little hardback from Sasquatch Books, with a tactile, letter-press type cover. The illustrations are gorgeous and the fable is poignant and tender, reminding us that we are surrounded by enduring love, even in loss. This is the perfect gift for anyone going through a breakup or other heartache. It is wonderful." 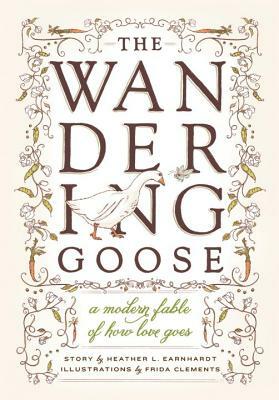 "Readers who love heartbreaking and beautifully illustrated fables look no further than The Wandering Goose: A Modern Fable of How Love Goes by author Heather L. Earnhardt... This book is well written from start to finish and the reader feels Bug’s feelings as she falls in love and then goes through heartbreak. The illustrations by Frida Clements are gorgeous and make the story come to life. This book is wonderful; readers will not be disappointed." "Winsome illustrations from local artist Frida Clements drape Earnhardt’s words in magic—words ('You have made your way into this heart of mind like a stone falling into a clear pool,') restaurant regulars will recognize from their inscription in the restaurant’s tables. Words which get at the ineffable mystery of the cycle of life, and of the many ways it feeds us. A book for wise children and beauty-loving adults." "...it’s one of those rare titles that manages to speak to both kids and adults... It’s equally surprising and refreshing that Earnhardt, the former Volunteer Park Cafe co-owner known for baking what are arguably the city’s best biscuits, would publish a “true” fairy tale before a cookbook... The text is simple and compelling enough for young readers, but peel back the layers and you’ll be gripped by a thick sense of nostalgia. The story of falling in and out and back into love is your story, or at least it very well could be: partnering with someone, mourning the loss after their departure, then gaining a greater resolve to begin again... The pages are dreamily illustrated by Seattle-based graphic designer Frida Clements. Like the text, the visuals hover between understated and lush." "Oddly touching, this is the illustrated story of a bug and goose who spend time together, become friends and eventually fall in love. Short and bittersweet the illustrations and lovely, and though tinged with loss the story is hopeful and life affirming." "This story explores love, loss and healing between the unconventional bug and goose couple. Earnhardt also owns The Wandering Goose restaurant in Seattle, which was inspired by this story."